German author; born in Berlin April 8, 1868; educated in and graduated from the university in that city, receiving the degree of doctor of philosophy. He has since lived in the German capital. His first published work was the "Memoiren des Cagliostro," Berlin, 1892, which was one of the volumes of the "Memoiren-Bibliothek" (in 15 vols.). This was reprinted separately in 1894 under the title "Abenteuer des Geistes." In 1896 his novel, "Aus Dämmerung und Nacht," was published. In the same year he founded the "Monatsschrift für Neuere Litteratur und Kunst," which he edited and to which he contributed, besides a number of literary reviews and poems, the following essays: "Vom Weibe," "Boulevard-Hellenismus," "Ein Satirisches Capriccio," "Die Ehe im Modernen Roman," "Maurice Maeterlinck," "Yvette Guilbert." The first number of the "Monatsschrift" appeared in Oct., 1896; and with the issue for Sept., 1898, the publication was discontinued. In 1899 appeared his critical work, "Die Dichter des Todes in der Modernen Litteratur," and his "Gesammelte Essays"; and in the following year his monograph on Maeterlinck was republished. He has also translated a number of works from the French; among others, from Jeanne Marni: "Pariser Droschken," "So Sind Nun die Kinder," "Grossstadtpflänzchen," and "Die Memoiren des Herzogs von Lauzun." 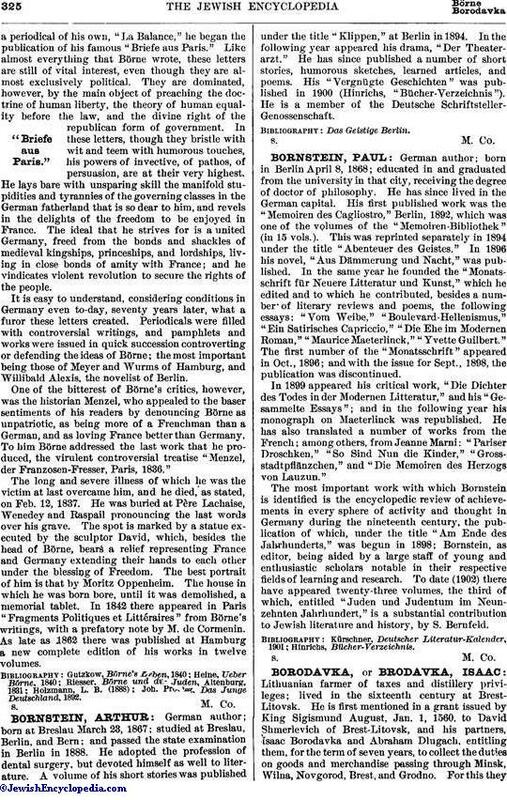 The most important work with which Bornstein is identified is the encyclopedic review of achievements in every sphere of activity and thought in Germany during the nineteenth century, the publication of which, under the title "Am Ende des Jahrhunderts," was begun in 1898; Bornstein, as editor, being aided by a large staff of young and enthusiastic scholars notable in their respective fields of learning and research. To date (1902) there have appeared twenty-three volumes, the third of which, entitled "Juden und Judentum im Neunzehnten Jahrhundert," is a substantial contribution to Jewish literature and history, by S. Bernfeld.